The problems of the world are not going to be solved by governments, corporations or religions, but by people around the world working together as one, with a common focus that is consistent, persistent and insistent in its scope. The goal is to have tens of millions of people doing the same thing on the same day, and unleashing that much powerful, positive energy into world. And because many problems take more than one day to effect change, we have the Cause of the Month as well. So again, we ask you to volunteer and add your efforts to the chorus of activists that embrace all segments of society, as we strive to create the peace and harmony that will give balance to world, and bring happiness and longevity to its children. Social Responsibility Clubs are perfect for getting people together to help others, learn more today. We encourage anyone – from students to the elderly – to start or join a 16 Things Social Responsibility Club in their school or community. Clubs work to further the programs of the organization on a community, national and global basis while providing a great opportunity for personal development. 16 Things Clubs can take many forms. Whether your focus is limited or touches upon many topics; whether it’s at your school or in the city, what matters is that you get involved. The next step is in your hands, decide what aspect(s) you want your club to cover and sign-up on our website. The truth is that anything worthwhile takes a little effort. We all know it. The key here is simply … Do it! Start a club whether it’s at your school or in your city; whether the focus is limited to one area or whether it encompasses many. Everything you do has benefits provided you make it happen and stick to it. Everything you do has a ripple effect. And you never know who might be positively impacted because you made the decision to start something and followed through with it. That’s a big deal. Thanks. You’re now ready to make a difference! And together we’ll make it happen! WANTED: Volunteers To Change The World! 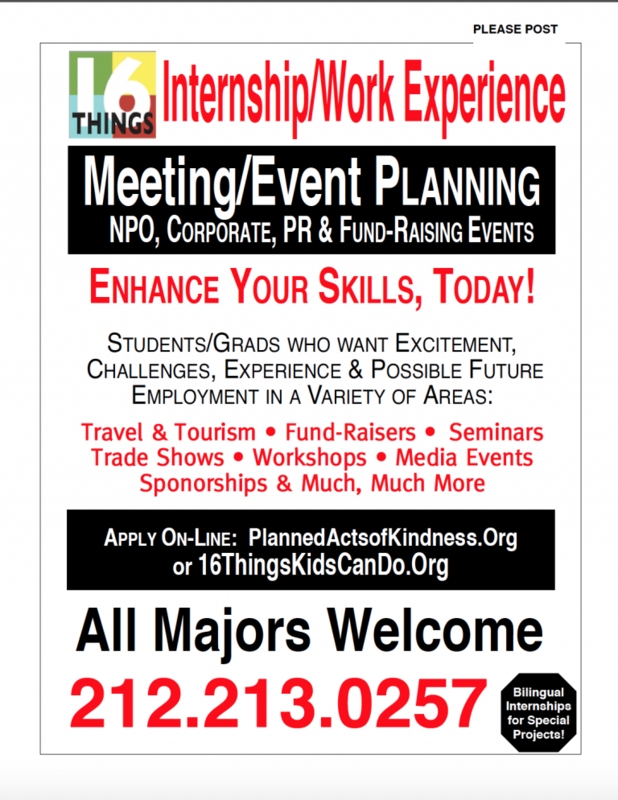 Do Internships, Work Experience & Career Track Programs! Get Involved. Get Informed. Get Going! Community Outreach Workshops help bring the community together as well as help those who need it! • Legacy Building Workshops: 5 Keys for Financial Success: Expense Savings, Debt Management, Affordable Legal Services, Financial Literacy and Planning, and Increasing Income. Our Workshops … Your People! Global Outreach Programs will help bring people together around the world, will you join us? The problems we face in our country are not confined to just our citizens. Regardless of your nationality, people all over the world face similar fundamental issues: Health, financial well-being, quality of life issues. Our book series will not just be translated into other languages because we have the answers for the rest of the world on these issues. With your help, we will be creating Board of Advisors comprised of experts and influencers from each country. The BOA are charged with the social responsibility of pulling together experts for inclusion in the books in order to make the information culturally relevant and expedient to the people. Additionally, everything from our educational programs, workshops, work and entrepreneurship programs will be available in service to others. Fund-Raising and Event Planning will help us raise the funds we need to help educate and train others. Whatever your interests, whatever your experience — There’s always an opportunity to get involved and make things happen! Television & Internet Production is a great way to give back as well as share the message. 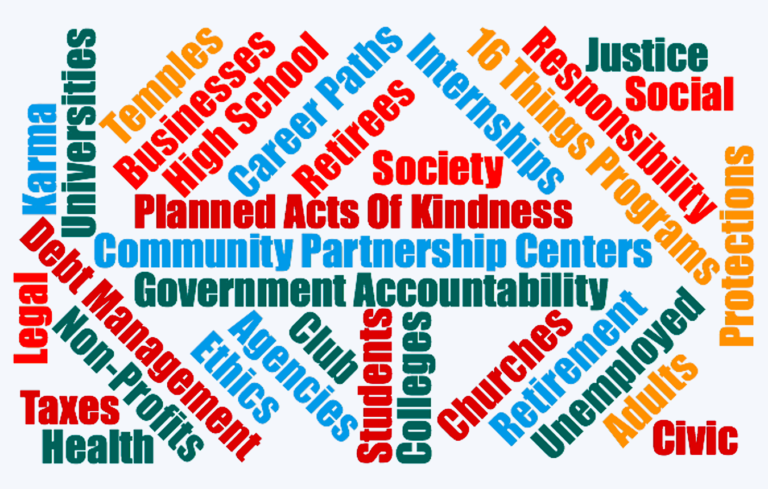 • 16 Things’ The Karma Club: Featuring Planned Acts of Kindness from individuals, schools, churches/temples, non-profits, government officials, and companies around the world. • 16 Things’ TV Magazine: Think “60 Minutes” meets “Entertainment Tonight” and you have format for our Magazine Show. Two in-depth explorations of featured topics and a half dozen departments with 10-15-second clips. 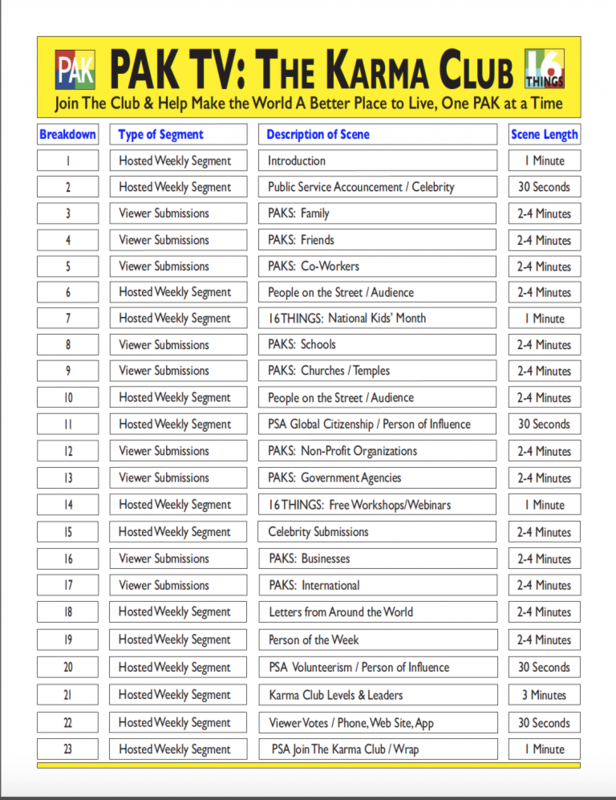 Segments are suggested, and sometimes produced, by viewer and clubs around the country. • 16 Things’ Cooking with Kids TV: It is a quick-paced show featuring celebrities, experts and kids exploring health and nutrition issues, solutions and demonstrations of a recipe or two. Hosted by kids and produced for kids of all ages. • 16 Things’ Celebrity Quest TV: 16 Things Fund-Raising Event that empowers kids in schools and communities across the country to experience what it’s like to compete in a “Socially Responsible” Talent Contest that rewards effort and performance at all stages. Contests in different communities are filmed and submitted with clips forming the basis of the TV Show. As winning Individuals and Groups move up in the competition they are pitted against each other to narrow down the competition … ultimately culminating in the grand finale where the winners are chosen. Visual Communication Content & Programs will help us spread the message to new people and help get them involved, join us today for a better tomorrow. 16 Things Visual Communication Content includes everything from Graphic Design to Animation to Video Production. From pre-production through post-production, from on-air talent to internet social media, whatever you’re interested in, we have the programs that can put your interests and skills to use for the benefit of others. Creating Testimonials to Telethons, from Public Services Announcements (PSAs) to Internet and Cable Based Television programming.